This is a question we regularly get asked at Dogs in Motion, and just like human diets, I don’t know that there is one perfect answer for all pets. There is so much information out there it can be very confusing for pet owners. But there is no doubting that the incidence of diseases related to diet and nutrition have increased in dogs and cats dramatically in the last 15 years. Things like diabetes, obesity, skin disease, irritable bowel syndrome are now commonplace. These health conditions of course are multi-factorial, but there’s no doubting diet contributes to their expression and severity. Here at Dogs in Motion, all the staff feed their pets raw food diets – interesting coincidence when we have all come from different backgrounds and experiences. The reason we like raw food is that we believe if you take a bit of extra effort to feed your pet healthy food, the way mother nature intended, you get a healthier pet, that lives longer, with less disease. This is no different from what I would tell my human patients. To recover fully you must adhere to your rehabilitation program, maintain a healthy weight through regular moderate exercise and you must eat a healthy diet, eliminating processed and junk foods wherever possible. Why should I then suggest anything other than the same advice to my animal patients? Take a look at Dr Bruce Syme’s website. I really like his products and they are now packaged for convenience so its easy to feed raw. 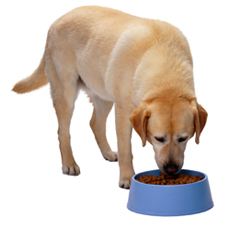 Please note if your pet has a particular health condition, you need to be guided by your pet’s vet as to an appropriate diet for your pet.